Earlier this week the Facebook page for this blog hit 20,000 followers. I remember when my Facebook page hit 1,000 followers and I was blown away. We had a giveaway to celebrate! Now, at 20,000, I have to admit the feeling is a bit different. I’m thrilled and humbled and flattered by the milestone, but it’s not just my page anymore. This group that’s grown up – of gardeners, cooks, homesteaders, thoughtful spenders, green-living advocates – it’s a critical mass of people who give and take with each other and with me. It’s community. I’m honored to step back and see how this community has grown in the just-under-three years since I started this blog. Back then I thought maybe people in my hometown would like to know when to plant their fall cabbages (hint: July). Now, people on my Facebook page answer other people’s gardening questions. Everyone is just happy to pitch in with what knowledge they have. It’s kinda amazing to be a part of, honestly. I try not to let this blog become a shrine to self indulgent navel-gazing, but regular readers may have gathered that 2012 was a rough damn year for me personally and 2013 has mostly been about recovering from 2012. Through up moments and down, writing here – about my garden and my homekeeping and the constant exuberant cycles of life and growth and rest – has been a comfort and a challenge and a joy. Periodically, readers email me, or comment that my posts have inspired them or motivated them or taught them a new skill. But I know that sharing what little I’ve learned in the many years I’ve gardened inspires me, and teaches me, and encourages my own habit of continued (some might say compulsive) learning. And as often as I teach, I am the student, learning from our community and being inspired by it. So it is a two way street, and I thank you so much for being part of it. Thank you for reading, for taking the time to like and share, and for commenting. Thank you for being a member of this community. Just over two years ago, I hosted a giveaway for hitting those first 1,000 Facebook likes. Now I think it’s time to do it again. So, here’s the deal: I’m feeling mellow, I’m feeling contemplative, I’m feeling winter coming on. 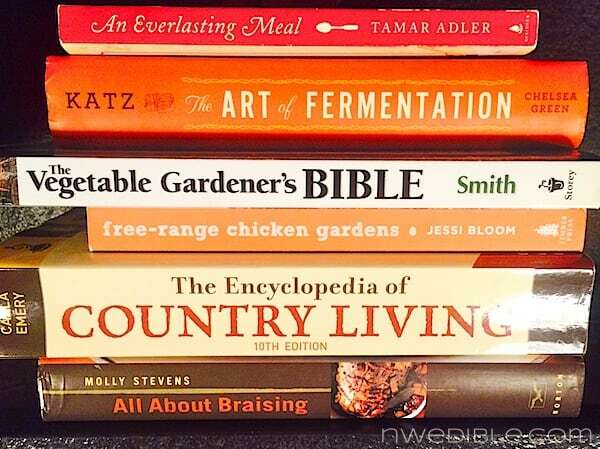 I would love to give someone a suite of my favorite kitchen, home and garden books to get them through the off season. Just add coffee, and you’ll have my favorite way to spend a quiet afternoon. An Everlasting Meal: Cooking with Economy and Grace by Tamar Adler. A beautiful ode to simple and frugal cooking as a way of life. Art of Fermentation by Sandor Katz. Last time I had a Facebook page celebration I gave away Sandor Katz’s first book, Wild Fermentation. Giving away his follow-up work, an even more comprehensive look at fermentation of all kinds, just seems appropriate for this follow-up Facebook milestone giveaway. Vegetable Gardener’s Bible by Ed Smith. This is my favorite beginner’s gardening book. It has all the basics of vegetable gardening explained in an accessible way and is useful to gardeners in nearly every climate. All About Braising by Molly Stevens. This is possibly (probably) the best cookbook in the entire world. Stevens is a gifted cookbook author, and inspires and educates through her writing. Every recipe can be counted on to turn out deliciously. Free-Range Chicken Gardens by Jessi Bloom. This book is the best source for know-how for people who want both happy hens and thriving gardens. The Encyclopedia of Country Living by Carla Emery. This book is a tome, a legend, a doorstop sized work that manages to be as engaging and funny as it is comprehensive. No small feat. A deserved classic. In celebration of the 20,000 Facebook Like milestone, one lucky winner will receive one shiny new copy of each of these books – essentially a productive homekeeping mini-library delivered right to your door. I’m self-sponsoring this giveaway just to say thank you, so this is just between me and y’all. If you haven’t already, like the NWEdible Facebook page and leave a comment here on this blog post letting me know you’ve done so. 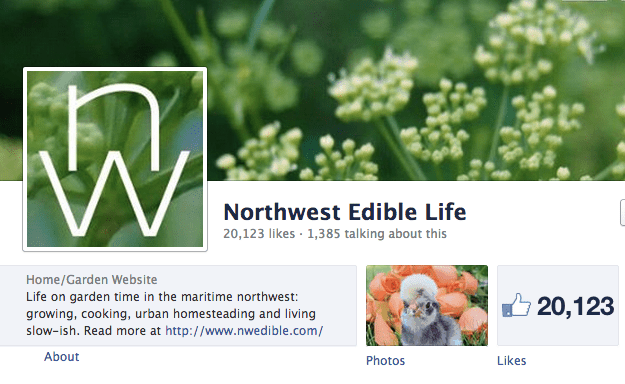 If you already follow NWEdible on Facebook, just tell me that. If you have a conscientious objection to Facebook, let me know what it is and we’ll call that good enough. I hate giveaways that exclude people because they aren’t into whatever social media thing is being pushed. It’s not a condition of entry or anything, but I would sure love it if you guys would remember that my bread and butter is the sharing you do of my blog posts and Facebook page. Please – like, share, comment and let your friends know about about my blog and my Facebook page. So, one comment and you’re entered. One entry per person, US residents only please. Any funny business with multiple entries and I disqualify ya. Sorry to my international readers; it’s not you, it’s shipping rates. Contest open until Thursday, October 3rd, 8 PM PDT. Winner will be drawn randomly and contacted via email to coordinate delivery of prize. Good luck and thank you all for reading! This contest is now closed. Thank you so much to everyone who entered! Previous Post: « Figs in the Pacific Northwest: Will My Unripe Figs Ripen? Enjoy your Facebook page and love working with your husband. We need to meet in person one day! Congrats on over 20,000 FB followers! I’m one of them now. That looks like a great set of books, and thanks for offering the giveaway. Just found you looking for a pectin free jam. Liked ya on FB! I liked your facbook page. I don’t enjoy facebook, so I canceled my account about a year ago. I started following your blog last February and I don’t know how to tell you how much it has helped me in my garden! Thank you for your hard work. I would love to win those books! I found your blog a couple of months ago and promptly bookmarked it for future reference/inspiration. I didn’t know you had a facebook page, but I do now and I have liked it (FB name Jojo Viola). Thanks for all of the tips you share! I do not use Facebook because I have concerns about privacy and monitoring. But over the last year, I have shared your blog via email links with friends and family. Thanks for all you do. I’d love to win this great stack of books! I didn’t even know you were on Facebook! Just ‘liked’ your page. I’m very excited about this giveaway! I’m just not into the face bookery, thanks for including everyone anyway. I do tell friends about your blog though! I love your blog, just spread my love on Facebook too. Keep up the excellent writing. I love your blogging. Found you several months ago when I cried from laughing over your Terrible Tragedy of the Healthy Eater. I’m not on Facebook because I know I would lose hours of each day being sucked into its vortex. It’s just better for my whole family if I stay away. Can I say that I love that you’re including those of us who opt out of social media? Thank you!